In conjunction with the Steel Industry, Schaeffler has developed a new quenched and tempered steel specifically for slewing rings which are subject to extreme loads during blade and tower adjustment. This permits full tempering and quenching of the steel and, as a result, provides outstanding strength values, even with large ring cross sections. Zinc thermal spray surfaces, multi-layer painting and finished seal surfaces also provide the highest level of reliability, rating life and security against premature damage, such as fatigue in the raceway and surface corrosion. The bearings are suitable for use in ambient temperatures as low as minus 40 degrees Celsius due to the material and the applied surface protection. Wind turbines must be aligned to the wind conditions. The tower and the rotor blades are adjusted so that they make optimal use of the wind conditions and are not subject to excessive loads that could cause damage. 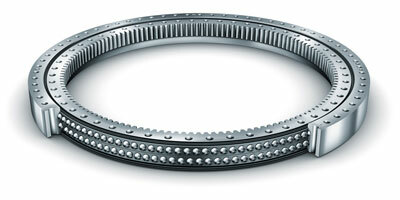 Schaeffler currently develops and manufactures slewing rings with an outside diameter of up to 4,100 millimetres for wind tracking. Due to their design, they can transmit radial and axial forces and tilting moments. They are designed as single row or double row four point contact bearings without gear teeth or with internal and/or external gear teeth. Their reliable function is a significant prerequisite for cost-effective operation of wind turbines. Schaeffler has introduced a new Wind Power Standard (WPOS) for its INA and FAG brand bearings for wind power applications, which fulfils the increasing demands in terms of reliability placed on wind turbines and components in the wind power sector. This new standard for products and processes means Schaeffler is ensuring outstanding quality and reliability. All bearings for wind power applications will be included in this new wind power standard by the beginning of 2014 and will also be labelled with the WPOS designation.